One of my favorite breakfast combination is avocados and eggs. Such a healthy choice for breakfast or maybe brunch. There is no wrong way to eat avocado, but breakfast is really a great time of the day to enjoy it. This green savory fruit is great with eggs, it's like peanut butter with jelly. 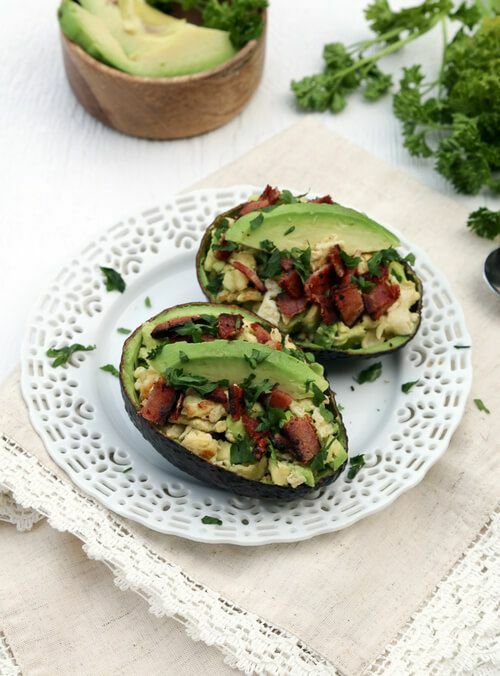 So start your day with avocado scrambled egg with bacon will help keep your morning productive. What makes avocado so healthy is that it is full of the kind of fat that is good for us. Unlike unhealthy fats, this fat raises good cholesterol. As for the eggs, a reason to eat more of them for breakfast is simply because they improve brain function which is exactly what we need before we head to our meeting, class or work. And as the cherry on top, the parsley, keeps our heart, teeth and gums healthy. Now you have a new delicious idea for breakfast, enjoy! On a warm skillet, cook 1 slice of bacon both sides. Whisk together 2 large eggs, 1 Tablespoon milk and a pinch of salt. In the same skillet from bacon, add egg mixture and cook, stirring constantly, until eggs are just set, will take a minute. Remove skillet from heat. Slice avocado in half, take out the pit. Carve out the inside of the avocado, chop and add it to the eggs. Chop bacon into small bites and add to the eggs and avocado. Sprinkle fresh parsley and enjoy.